Join us in the West Seattle Bee Garden, in High Point Commons Park, inside Neighborhood House, and on Lanham Place SW - the street to the west of the park, which will be closed to traffic! Show up early for the Honey Run, a free, informal, fun run in High Point Commons Park! No registration (or training) is required. Start at the High Point Commons Park Amphitheater (near the south end of the park) anytime between 9 and 10:30. At 10, catch Ella-Bella Bee and the Pollinators who perform an original, interactive musical at the Amphitheater! Join the Parade at 11:30! Follow the Big Bee who leads the way! All are welcome! Little Bees! Pets! Musicians! Everyone! Enjoy amazing live music! Legendary songstress, Laura Love performs with Terry Hunt between noon and 2 at the Amphitheater! Visit the Bee Garden! See and learn about honey bees! At noon, Bee Garden creator and beekeeper, Lauren Englund will give a Hive Demo! Taste or buy honey! Puget Sound Beekeepers will be in the Bee Garden from 10 to 2, or until the honey runs out. West Seattle Be Prepared will host an Urban Survival Skills Fair. Learn useful emergency preparedness skills and hacks that will help you survive a disaster! Tilth Alliance brings their popular worm bin, info about their Master Composter Sustainability Steward and Enviroscapes programs, and the Garden Hotline. Learn how to create a bee-friendly garden! Camp Long hosts interesting bee and pollinator-related science activities! ROAR hosts popular and fun activities such as bicycle-powered smoothies! The SW Police Precinct will offer tours of their mobile precinct unit. Seattle Fire Department will bring a fire truck and also talk about fire safety! High Point Resource Coalition member organizations will be here, as well as other local West Seattle groups. You'll also find face-painting, balloon art, plants for your garden, and more! Plan to shop local, and support artists and businesses who care about bees and promote environmental stewardship! You'll find more art and science activities, as well as international food and community activities indoors at Neighborhood House. Woodland Park Zoo will bring "Animal Ambassadors" from their Up CLOSE program. Pop-Up Sewing will be back - this year with a Kid's Corner! Learn how to sew, repair and re-purpose textiles (to keep them out of landfills). Materials and tools are provided, free! Get a West Seattle Bee Festival iron-on patch before they're gone! 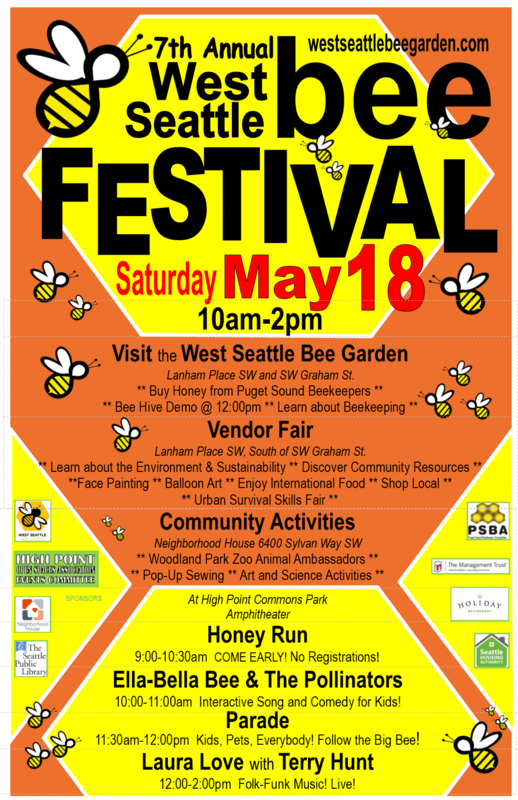 Help us celebrate our 7th Annual West Seattle Bee Festival on Saturday, May 18th! Do you want to volunteer or "bee" part of the festival? If so, please email us, or text/call: 206 240-5561. Help us share the buzz about the Bee Festival and the Bee Garden! Share this page with your friends, family and neighbors! Please like us on social media! Follow West Seattle Bee Garden on Facebook, on Instagram, and on Twitter, @westseattlebee. Follow the West Seattle Bee Festival on Twitter, @WS_BeeFestival. ​Curious about previous festivals? Visit the more... section of our site for photos and highlights from each!